We all know I have a love/hate addiction problem with twitter. I love it. I’m addicted to it. Sometimes twitter hates me. Due to concern that your account may have been compromised in a phishing attack that took place off-Twitter, your password was reset. Please create a new password. This was about the same time an app that I was using stopped working and wanted me to log in again. And I wouldn’t have noticed it if I hadn’t first tried to reset my password about 1:20 PM. And reset, and reset, and reset …. and endless loop of reset emails! And then I contacted support@twitter.com and guess what, GOT THE SAME info from the help page that had prompted me to email the support team in the first place. I finally got in after switching browsers. *sigh* I have a headache now. I cussed on twitter – well as much as I do out of respect for my followers. They all have such good vocabularies I am sure they filled in the blanks and missing syllables. I need help. No doubt about it. And now it’s time to get that coffee. Since I know from experience that Fresh and Easy isn't everywhere, I will provide ingredients and/or substitutes where necessary. Pit and remove avocados from their skin and place in a mixing bowl. Add 1-2 tablespoons of ranch dressing per avocado to the bowl and mash with a fork (or blend in a blender like my mother did). Set aside. Take lettuce and cut head in half, shred thinly. Heat large saute pan on medium high heat. Once warm, add 1-2 tablespoons of olive oil. Carefully add the contents of the beef fajita pack (or steak, onions, etc) to the pan. Toss ingredients to allow all sides of the meat and vegetables to cook. While steak is cooking, microwave tortillas for about 15-20 seconds per tortilla. Last night I watched Benjamin Button for the first time. A few months ago I read the short story by F. Scott Fitzgerald. Talk about taking license with a story! The general premise was the same, but there the similarity ends. Events, characters, settings – all different. The movie changed the books events to coincide with Hurricane Katrina. I feel robbed. I would have liked to see Benjamin Button ride with Roosevelt and the Rough Riders, as well as show up as a 15 yr old in his uniform for the reunion. The movie really rode rough-shod over the latter half of Benjamin’s life when it truly became hard for him for him to deal with his very unique way of aging. The movie romanticized it to the point of being nearly unrecognizable. In the story, he goes to college, marries, has a child, and raises his son, all while aging backwards. This causes a similar set of problems as when he was first born. And we're having the salmon tonight. Last year I made it a goal that I would attend the San Diego Comic Con this year. It is only the biggest and best Con *EVAH*. So guess what? Today I am at work. Tomorrow I will be at work. This Saturday I have chores and errands to run. AND – despite being on twitter 24/7 (so it seems), I missed all the eBay auctions of Comic*Con passes. Even Google taunts me today. Logo created by Jim Lee at DC Comics. So I will be watching the official stream, the stream and Facebook updates of all my friends … and wondering yet again why I couldn’t meet a simple goal. Please, leave a comment. I like the dialog. And Blogger, I am really getting tired of this. I have used your service since 2001, don't make me move now. is so fresh and easy! I had a blast last Thursday night. Thank you, Oakley, for letting me be your guest. I think you have made me a convert. Can I join the monastery? The following review is based on the NOM factor and has plenty of asides. Grab a napkin, you're going to need it for all the salivating. And now on to the important stuff, THE FOOD. First, appetizers – wine (La Giosa Prosecco – a sparkling wine, St. Helens Reisling) – there were also two types of red, but I stuck to the whites. There were also fresh veggies, pita chips, bread, cheese, and NOM artichoke dip. I’ll have to get the list from @Fresh_and_Easy I want more of the cheese. First off, I must say that @sallieb, @jennifervides, and Chef Mike put me right at ease. Usually I am a wallflower, and would have waited for Oakley to show up, but they got me going right from the start (thanks guys!) It helped that the conversation revolved around food. I really love food. The wine probably helped a little too. We officially got started about 7:30 making pizza. 10 minutes from start to finish, minus the baking time. And even though it is summer time and often (especially this week in the Southwest!) too hot to turn the oven on, Chef Mike suggested using a toaster oven. Nifty. Who needs Pizza Hut when you have Fresh & Easy? While the pizza cooked, the teams started on the other menu items. 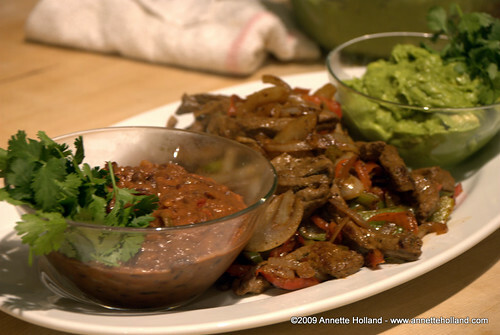 Oakley, Lupe, and I worked on the avocado ranch dip for the steak fajitas (pictured above), Bernadette and her team worked on the Apricot Chicken Fingers, and Amy's team that worked on the Salmon. What I loved about this demo is that we were able to improvise a bit (that's what happens when you get a bunch of foodies together). Lupe and I felt the avocado ranch needed a little more *oomph* (Oakley accused us of being ethnic, LOL! but all in love). Chef Mike had just what we needed, some lemon and salt. The salmon (with Thai approved Peanut sauce) NOM - I'm biased. I cook salmon a lot and this was lacking ... something, but it was perfectly flaky and Oakley approved the peanut sauce (something I am not overly fond of). The chicken fingers with apricot mustard sauce -- OMGNOMNOMNOM -- had these for lunch the next day, leaving the pizza for my mom. Dessert -- absolutely sinful banana cream pie, divine tiramisu, and ogasmic chocolate cupcake. Need I say more? For more nommage, check out the slideshow below. My favorite podcast author, Tee Morris, has a new non-fiction book out called “All A Twitter” and you can buy it now from Amazon. Why am I stoked about a non-fiction book? For one thing, his style definitely makes Twitter accessible for non-techies AND *drumroll please* I got to consult on the Android/G1 portion of the book! So please, if you don’t “get” twitter, get this book! Make Twitter work for you–right now! Twitter! Everyone’s talking about it. Its membership grew over 700% in just one year! Now, learn how to make the most of Twitter–in your personal life, your business, everywhere! All a Twitter delivers quick, smart answers to the questions everyone’s asking about Twitter: What’s it about? What’s it good for? Is it worth your time? How do you get started? Where can you find great Twitter feeds to follow? How can you build a worldwide audience for your own Tweets? You name it, Tee Morris answers it–and shows you exactly how to do it, step-by-step, in plain English. No experience? Looking for something new to do with your Tweets? No problem: this is the Twitter book for everyone! 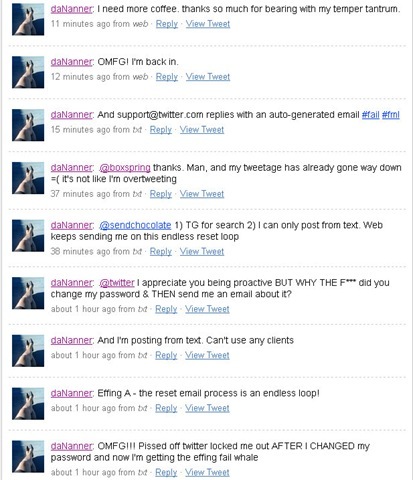 • Swapping Tweets on your browser, on your desktop, and on your phone! Sushi, Friends, and Stevie Wonder! Wow! What a Monday night. Not sure the rest of the week can compare. I met @troyredington and @jeremydlawrence of FatWallet, and @chews for what I thought would be a quick meet'n'greet. Let me tell you, those guys are TONS OF FUN! @chews has incredible energy and it was fun geeking out at The Snug (cider on tap!) After about 2 hours of talking about 3gs hacking, Wii hacking, awesome entertainment systems, and @mindsharelabs we got hungry. Headed over to The Pit Fire, who were closed, opted for Tokyo Delves down the street. EPIC WIN!!! People have been telling me for months to just go there, "It's an experience" they say. No $#!+ Sherlock! Wow!!! Sushi meets karaoke and live entertainment. Even the chefs dance. And the chicken dance. Our waitress/hostess Lauren was simply awesome, the bartender Mike did a really good MJ tribute and 'NSync routine (though I still contend that the best part of that was watching @chews. I didn't take any pictures or video of that though). Sake bombs. Dragon boat of yummy sushi goodness. The best part of the night? My jaw hitting the floor when Stevie Wonder walked in for dinner. And sat at the table behind us. A few photos below, and video of the sake bombs. Hoping to meet up with them one more time before @troyredington and @jeremydlawrence head back to the Midwest. Also known as Fudge Drops. My mom made these for a bake sale last week and I gushed about them on twitter. They are QUITE delicious. This post is especially for @crispydragon, who asked for the recipe. Enjoy! Heat oven to 350F. Grease baking sheets; set aside. Melt chocolate and butter/margarine in a small saucepan over low heat. Set aside to cool. In a medium bowl, beat eggs. Beat in sugar until creamy. Stir in cooled chocolate mixture and vanilla (make sure mixture has cooled some, otherwise the batter will be thin). Blend flour, baking powder and salt; stir into chocolate mixture. Stir in nuts and remaining chocolate chips. Drop by teaspoons, 2 inches apart, on greased baking sheets. Bake 8-10 minutes. Let stand on baking sheets 2 minutes. Remove from baking sheets; cool on wire racks. I don’t know why I worry, the statistics say that flying is safer than driving. I just worry about my son and traveling when I am not the one doing the driving or flying with him. And this is the first time I wasn’t able to get (translate afford) a non-stop flight. At least not from Burbank to Portland. But, he totally fits his nickname, and was Chill and relaxed about it. Completely different from last year when he wanted me to fly up to Portland, pick him up, and fly back to LA with him. All on the same day. This year he’s confident enough to travel from PDX to Hillsboro on the MAX (which he won’t have to do, thanks to my sister-in-law). So long as he has a roof over his head and food he’s “invincible” – his words, not mine. Did I mention that he’s a teenager now? My little boy is growing up … and I’m not sure how I feel about that anymore. Despite his invincibility, I’ll still worry, because that’s what moms do. Update: 10:20 – Josh just called to let me know he made it to the gate at this next connection. So far so good. Update: 12:42 - He made it to Portland and my SIL is on her way to pick him up. I can breathe again. Optimus Prime talking about Haagen-Dazs, Jergen’s, and Saturday Night Live. Summer is perfect for salads using in season fruits and vegetables. This salad was a hit at a 4th of July potluck this past weekend. Josh used to like it with strawberries. They add an extra bit of sweetness. Mix dressing, sugar, and vinegar in a large bowl. Add remaining ingredients, mix lightly. Refrigerate for at least an hour. I woke up this morning to two heart-breaking tweets back-to-back. People were informing me that Eric De la Cruz had passed away over the holiday weekend. On July 4th to be exact. Veronica didn’t announce it until late last night. My heart breaks and I wonder if there wasn’t more I could have/should have done. Once Eric arrived at UCLA and made it onto the donor list I went back to my old avatar and didn’t tweet about him as much. I didn’t think there was anything more for me to do. But there is. We still need healthcare reform in this country. So please, contact your state representatives, sign the petitions, do whatever it takes to get health care reformed in this country. It’s appalling that we have so much wealth and yet so many Americans are uninsured and can’t afford quality health care. Rest in peace, Eric. I’m sorry I never got to know you. Tonight I sit looking at the full moon, thinking of you, while that song runs through my head alongside scenes from Sleepless in Seattle. I wonder how much of the last three months have been a dream. The longer we are apart the more I think it was all made up in my head, something to fill the void deep in my heart. How empty am I that I create a dream lover? How confused that even my dreams leave me bereft and abandoned? The moon is a comfort. It's real. And maybe, just maybe, you are looking at it tonight and thinking of me.